The Tomb of the Unknowns (also known as the Tomb of the Unknown Soldier) is guarded 24 hours a day, 365 days a year, and in any weather by Tomb Guard sentinels. 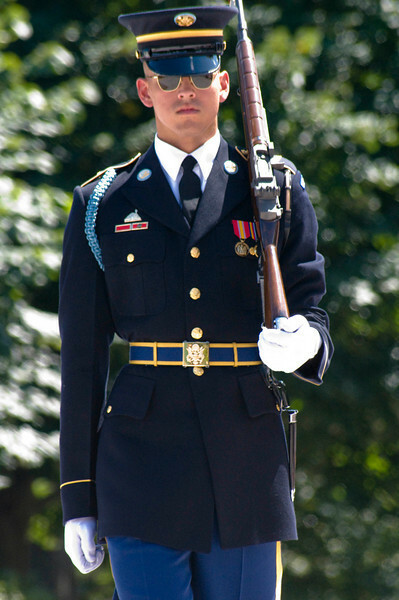 Sentinels, all volunteers, are considered to be the best of the elite 3rd U.S. Infantry (The Old Guard), headquartered at Fort Myer, Va. After members of the 3rd U.S. Infantry become ceremonially qualified, they are eligible to volunteer for duty as sentinels at the Tomb. If accepted, they are assigned to Company E of The Old Guard. Each soldier must be in superb physical condition, possess an unblemished military record and be between 5 feet, 10 inches and 6 feet, 4 inches tall, with a proportionate weight and build. An interview and a two-week trial to determine a volunteer's capability to train as a tomb guard is required.